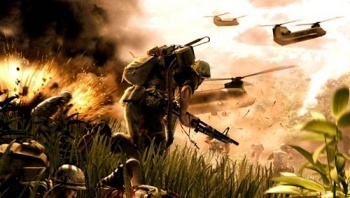 DICE has declassified the details of the first chance you'll get to kill someone with a jet in Battlefield 3. Battlefield 3's open beta will start Thursday, September 29th for anyone with a PC, PlayStation 3, or Xbox 360. Those of you who bought the limited/Tier 1 edition of last year's Medal of Honor, or have pre-ordered the PC digital download of Battlefield 3 through Origin, will be able to get in on the gun-play even earlier on Tuesday, September 27th. If you're a console user, DICE has confirmed that there will be no need to interact with Origin in order to play; the beta will simply appear as a free download in the Xbox Live Marketplace or the PlayStation Network. The PC version, however, will require you to install and log in to EA's Origin client to both acquire and play the beta through the application's demo page. During its beta phase, Battlefield 3 will only allow the game's Rush mode on a map titled, "Operation Metro." As the single mode available to early players, Rush seems like a great choice. Described as an "all-out warfare" experience, Rush should do a pretty descent job of allowing players to toy with many of the weapons and vehicles (including jets!) that have always made the series stand out. As with many betas, Battlefield 3 will not allow your amazing headshot percentage, or any other of your player stats, to carry over into the official release after the beta's end on October 10th. "We are still fine tuning the ranking system," DICE explained, "and we don't want to give beta players an unfair advantage when Battlefield 3 launches." The approach seems more than reasonable, but as with most new FPS titles, I'm sure we'll be seeing max level, fully-geared super soldiers just a week after launch anyway.